I can’t remember the last time I had this much fun on my iPhone. No, I wasn’t making music or playing a game. I was scanning barcodes with Occiptal’s app, RedLaser. Maybe that doesn’t sound like an exciting way to spend a Saturday night, but you really need to try this $2 iPhone app. Once you start, you won’t be able to stop. If you’re the bargaining type, you can give the sales person that info and see if the store will match the online price. But if that’s not your style or if the store won’t honor the price, then with a couple more taps, you can go to one of the online merchants’ sites and make the purchase, all from your iPhone. If you prefer to do more thorough analysis or buy the item from the comfort of your computer, you can e-mail yourself (or anyone else) a list of the products you’ve scanned, including their Amazon/Google links. I have been using RedLaser with my iPhone 3GS and my wife’s original iPhone. The app works almost perfectly with the 3GS, snapping a barcode almost immediately upon bringing it up on the screen, even when the barcode isn’t lined up perfectly within the target area. Not surprisingly, though, I don’t get quite the same level of performance with the older iPhone, but I am still quite impressed. 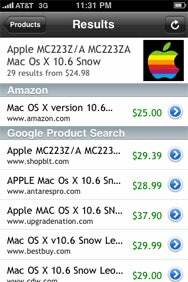 ... so that the app can find a list of online prices for the product that it pulls from Amazon and Google Products listings. Frankly, when I first started using the app, I expected good performance out of the 3GS’s 3 megapixel auto-focus camera, and the results I got surpassed my expectations. However, I wasn’t expecting much from the original iPhone, but the results were equally surprising, considering its 2 megapixel fixed-focus lens. (You do need a slightly steadier hand and a little brighter light if you have one of these older iPhones. Also, I wasn’t able to test the app with a 3G iPhone, but I would expect its performance to be in the original’s range since their cameras are virtually identical.) 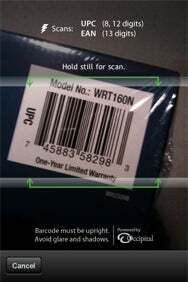 Once a barcode was scanned, the information came up quickly, even on an EDGE connection. There are a few areas of improvements I would suggest, but they’re relatively minor. If you go crazy with the app, your product list can get quite long, so it would be useful if RedLaser offered a way to assign items to categories—such as Music, Video, or Computers, for example—and then let you filter the list by those categories. Also, deleting items from your list is a one-at-a-time process. It would be nice to see RedLaser use a technique similar to the Mail app, allowing you to select multiple items and delete them in one step. RedLaser is truly a breakthrough development for the iPhone, as its current popularity in the App Store would suggest. Buying it is a no-brainer. If you make even one purchase as a result of using it, you will easily recoup the app’s $2 cost. So give it a shot. You’ll have a blast, and you’ll save some money too.